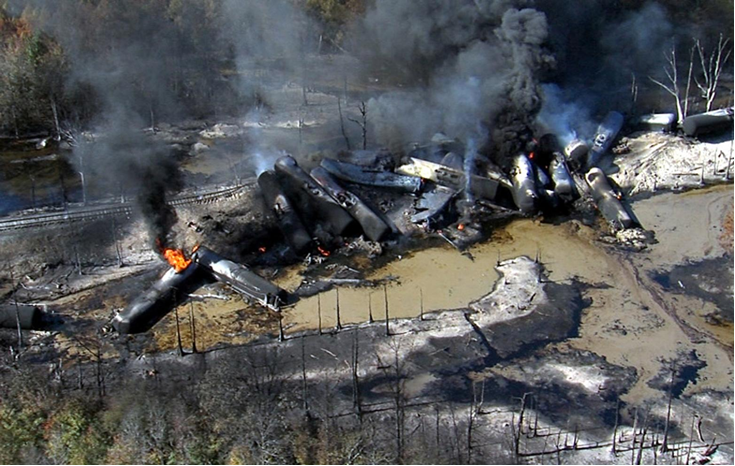 A 90-car train carrying North Dakota crude has derailed and exploded in a rural area of western Alabama. The incident left 11 cars burning and increased calls for tougher regulation of a boom in moving oil by rail. Twenty of the train's cars derailed and a number were still on fire on Friday afternoon [9 Nov], local officials said. Those cars, which threw flames 300 feet into the night sky, were being left to burn out. No injuries were reported. That incident, which the operator Montreal Maine & Atlantic blamed on a train engineer for not braking sufficiently on an incline, fueled a drive for tougher standards for oil rail shipments. Proposed measures included better testing of potentially explosive ultra-light shale crude and improved rail tank car standards. Tank cars made before 2011 have been cited by regulators as dangerously prone to puncture. It was not clear what caused Friday's accident in Pickens County, Alabama, nor how old the tank cars were. The train was being driven by two engineers, both unharmed, officials said. Though it appeared to pose no environmental risk, the accident still appeared to be the most dramatic of its kind in the United States since trafficking of crude by rail began to increase with the growth of shale oil production three years ago.